Maxxis riders came out on top at the inaugural Gusher GNCC, sweeping the ATV Pro podium. Chris Borich earned his fifth consecutive championship title, but Chris Bithell won the overall at Round 11 of the series, held September 21 in Foxburg, Pennsylvania. Borich started strong, grabbing the holeshot, but Bithell took the lead soon after, powering through the muddy terrain. Borich, along with fellow Maxxis rider Walker Fowler, followed close behind. Bithell held the front spot for the rest of the race, increasing his margin as the contest wore on. “I got off to a bad start, eating mud like crazy, but it turned out great! I knew a lot of those guys like their fresh goggles, and I knew if I could lead I wouldn’t need them. So I took off past them after the first lap in the pits into third place. Just after that I got into the lead, pinned it, and hardly looked back,” said Bithell. “I couldn’t have been any happier on the tires. These were the worst conditions I had ever seen. I didn’t get stuck one time. The quad, setup and tires just worked flawlessly.” Bithell rides Razr rear and Razr2 front tires in all conditions. 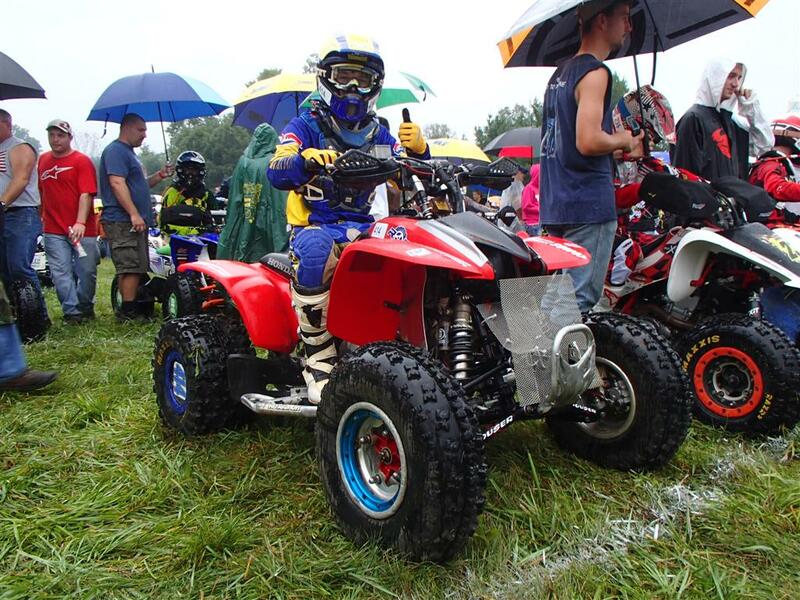 Foxburg, PA – Any racer who owns stock in a pressure washer manufacturing company came out on top at this past weekend’s race. Held on the 1200+ acre property of the Riverstone Estate, the inaugural Car Mate Gusher has secured its spot in GNCC history. Arriving early Friday morning amidst rumors of incoming rain, we set up shop along a fence line close to the exit with the hopes of escaping the majority of the mud. Yeah right! This property has never been ridden before, let alone raced, so about 80% of the trails were fresh leaving the other 20% for a few small field sections and some old logging roads. About an hour before the start of the morning race, we took a look at the radar to get a sense of where the rain was and all we saw was a green wall headed right for the track. The morning ATV classes took off just as that wall arrived and the rain didn’t let up for the next 6 hours making The Gusher one of the muddiest tracks we’ve seen, right up there with this year’s Mammoth and the Ironman of 2012.